Myriad Technologies is a leading Microsoft Gold Partner with specialist technical skills in naval environments. Myriad Technologies is experienced in implementing SharePoint within military deployments, especially ship-to-ship, and ship-to-shore operating scenarios. 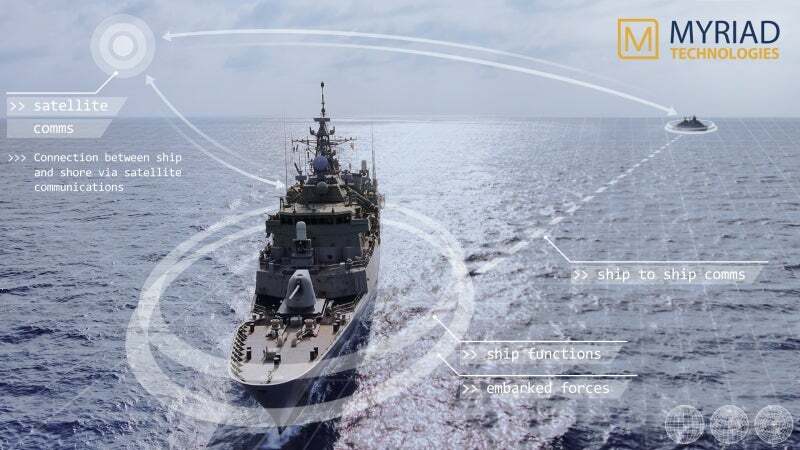 Myriad Technologies can extend client capabilities to collaborate and share information between ships and across limited bandwidth networks. In addition, our solutions are capable of supporting a complex security context that includes releasability, classification and caveats support, making them suitable for defence and other enforcement agencies. Our solutions are supported by a group of industry leading partners, including Microsoft for SharePoint, iOra for Replication and Nintex for process automation. By leveraging the capabilities of these vendors and products, Myriad Technologies produces Enterprise-capable, structured information management solutions that automate organisational processes and can be used across domains. Myriad provides its own structured activity manager (SAM) to act as the foundation for the warfighter-structured collaboration environment. With our enterprise approach, our clients are provided with timely, relevant, accurate and comprehensive information, while maintaining government and regulatory authority requirements for data management. Furthermore, Myriad Technologies understands the importance and requirement to be able to quickly adopt and deploy a new system. Our solutions can be rapidly deployed to almost any virtualised environment. By design, the implementation is low-risk and low-maintenance, but also highly flexible and extensible. Myriad Technologies is an Australian-based creator of industry-leading Microsoft technologies and information management solutions. Leveraging our specialist technical skills, we have also gained extensive experience in the defence sector. Myriad Technologies has worked closely with the New Zealand and Australian Defence Forces to extend and improve their capabilities. Myriad Technologies has announced its capacity to deliver Secure Search and Information Exchange (S2IX) via Microsoft Azure’s Australia Central cloud. The Australian Department of Defence has undertaken field trials to deploy Microsoft SharePoint into their tactical theatre. Communicating and collaborating securely from land to sea or over oceans is a major technological challenge. Fortunately, we have developed a platform which allows users to carry out business activities and operations even in geographically disbursed areas with low-bandwidth and high-latency networks. It was designed specifically to empower users involved in ship operations. In November 2017, replication services leader iOra revealed Myriad Technologies as 2017 Partner of the Year. In December 2017, iOra presented three Myriad Technologies team members with the iOra Most Valuable Professional (iMVP) status. Myriad Technologies has revealed it has been named a winner at the sixth Annual Nintex Partner Awards in the Solution Innovation category. Myriad Technologies has been a Microsoft Gold Partner since 2007, due to the company's commitment to helping organisations and individuals grow, compete and innovate in the technological sphere. In February 2017, Myriad Technologies founder and chief technology officer James Milne is presenting on Nintex at the second annual InspireX event in New Orleans, Louisiana.